If you’re going to ride a bicycle, safety should always be the first thing on your mind. 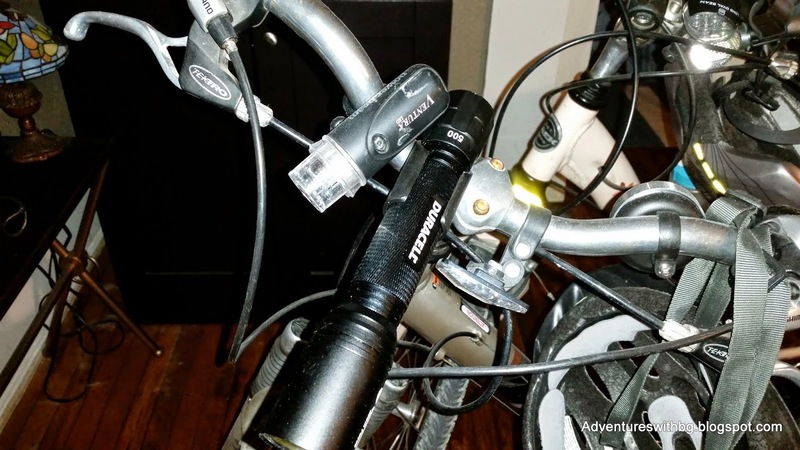 The Pyle Pedal Sound 3-in-1 Waterproof Bluetooth Bicycle Speaker, with Built-in Mic for Call Answering, Power Bank and Flashlight is a great way to make sure you never walk out of your door without your headlamp again. Following all of the rules of the road is a must. But asking other drivers to do the same and be fully attentive while behind the wheel of a car is a luxury you can’t assume. Visibility and cutting the number of distractions are your best weapons against your potential assassins, and the Pyle Pedal Sound 3-in-1 Waterproof Bluetooth Bicycle Speaker, with Built-in Mic for Call Answering, Power Bank and Flashlight gives you plenty visibility and its speaker keeps those pesky earbuds out of both of your ears. (Available directly from the manufacturer here) This was another Woot purchase for me and the waiting for it to come on sale was well worth the price difference. I bought it mainly for the speaker. I like to listen to music while I pedal and my phone is not loud enough without using headphones. The Huffington Post story linked here gives a few figures to illustrate why the use of earbuds is not the best of ideas while biking or walking. 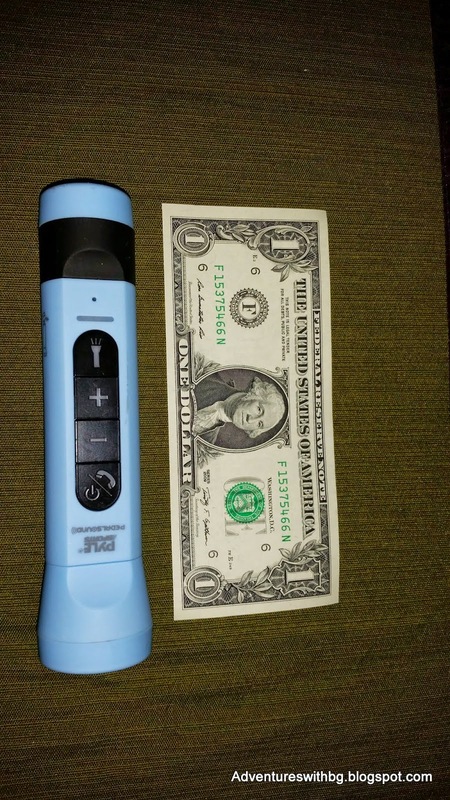 After it arrived I was very pleased with the size and weight of the Pyle Pedal Sound 3-in-1 Waterproof Bluetooth Bicycle Speaker, with Built-in Mic for Call Answering, Power Bank and Flashlight, (that is quite a mouthful the third time around. I call mine Gerry) at 1.5” by 6.1” and just under two thirds of a pound (0.63 lbs to be exact), it is solid and feels lighter in the hand than the previously reviewed K-3 Due’. Gerry has good sound that can be heard easily over moderate road noise and wind. I have also started using it as a shower speaker since it’s so much louder than my phone. Despite what Gerry’s given name suggests, it is not waterproof. It is rated at IPX4 which means it’s tested to resist splashing water from any direction, but not to be fully submerged. 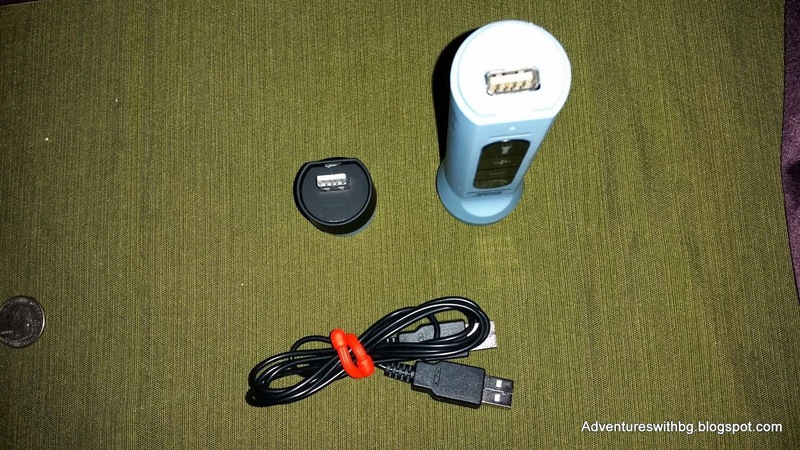 The flashlight has four settings: dim, bright, slow strobe, and quick strobe. The bright setting is luminous enough to reveal hazards better than most other headlamps I’ve used (and I use an additional cheap flasher to make myself more noticeable to motorists). Pairing Gerry to my phone was simple and the connection is stable to about ten feet. On the battery life front, Gerry is purported to have a ten hour playback time, but I have not put that to the test in one sitting. It does seem to rarely need charging when used as a shower speaker. I have tested the life of the light on bright and it ran for just under 4 hours and 20 minutes continuously. The call answer feature is a nice added touch by Pyle, the voice quality on my end is good enough and there have been no complaints from the people on the other end. The one feature I have not put to the test is the 2300mah power bank, my hesitation behind that being that there is no external means to gauge the battery level of the device. When the speaker is being used, there is an audible beep that gets more frequent as the battery drains, but that doesn’t help if you fully drain the battery to charge your phone without the speaker on. In addition to all of the above the Pedal Sound is sturdy; it has taken a few tumbles with me on the bike and hasn’t missed a beat. 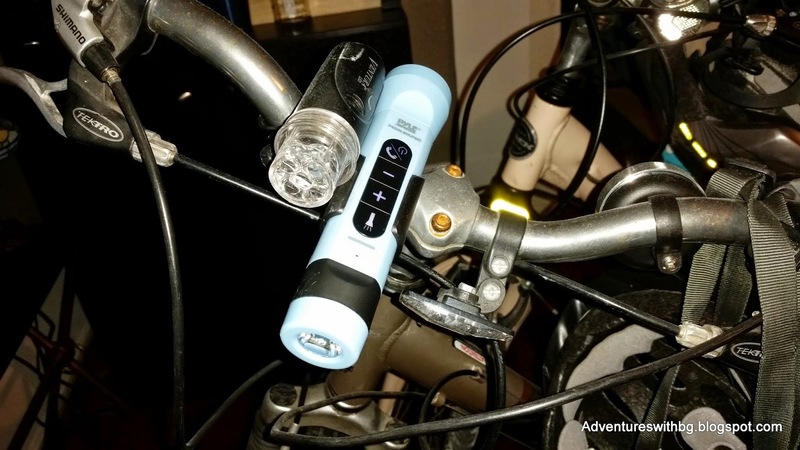 It also comes with an oddly versatile handlebar mount that fits my Duracell 500 lumen flashlight comfortably. Gerry does have a few idiosyncrasies: the charging of the device is odd by modern standards given that it charges with a usb to usb cable, so you’ll have to carry yet another cord with you if you want to charge it on the go. It makes sense if you take into account that the LED bulb head plugs into a usb receiver and the power bank feature had to be shoved into such a small package; it still seems weird though. The LED bulb head has to be popped off in an odd manner to reveal the usb in/output. It’s kind of like popping a bottle cap off with an opener. Pros- It’s a quality all-weather Bluetooth speaker, a four setting headlight, a Bluetooth call answerer, and a 2300 mah power bank. The speaker is loud and clear, the light is brighter than I expected it would be, and it is compact enough to pack with you on the trails while backpacking. On our backpacking trip around Lake Georgetown it played the music that made the last three miles of Jarrett’s and my fifteen mile day fly by. Cons- As I mentioned earlier, there is not an external power gauge to provide the peace of mind that your headlight will have the juice to get you home in the dark. The Pyle Pedal Sound 3-in-1 Waterproof Bluetooth Bicycle Speaker, with Built-in Mic for Call Answering, Power Bank and Flashlight does just about everything but scramble eggs, which given Pyle’s wide selection of products is likely something they are working on. It is not only a crucial safety device but the icing on the cake that is any outdoor adventure. Just remember to be respectful of the noise pollution on the trails, some people don’t appreciate Ke$ha bettering their outdoor experience as much as I do. Let us if you have ever used the Pyle Pedal and what you've got mounted to your bike. Also, if you like the blog, please follow us on Facebook.